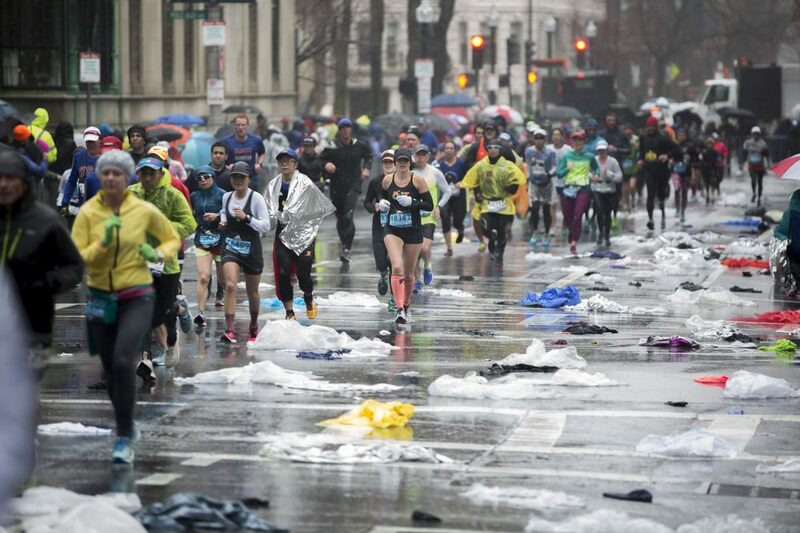 EXTRA EVERYTHING IN YOUR SEALED PLASTIC RACE BAG – During just the quarter-mile walk from Copley to the buses on the Common, my feet got completely soaked. I wore an old pair of shoes and socks I didn’t mind parting with and kept my race day shoes and socks nice and dry. I think I carried my shoes underneath my jacket because they wouldn’t fit in the plastic bag that the BAA allows you to bring. I wore an old pair of sweatpants over my tights and an old sweatshirt so my race attire would stay dry. Crushing the poncho game. See how happy I look? In reality I was completely warm and (somewhat) dry, at least in my core. RAIN PONCHO FTW – Digging through my closet, I found a plastic rain poncho – you know, the kind tourists buy at Disney World when they forgot to plan for a thunderstorm? BEST DECISION I MADE. I wore this poncho over a tank and tights and was really never cold at all. I meant to take it off after a few miles but ended up leaving it on until I hit Kenmore Square. DON’T OVERDRESS – Remember the air temperature. You might feel chilled to the bone before you start moving but I promise you that you will regret overdressing. Gloves and arm sleeves are key because they will keep your extremities warm without overheating you. Plus, you can stick hand warmers inside your gloves. WEAR A HAT – Find a hat with a brim in a material that will repel water. Even if you’re not a hat person, you’ll be glad you went for it. I added an ear-covering BUFF headband underneath to keep the tips of my ears warm. ACCEPT THE THINGS YOU CANNOT CHANGE – You’re going to be wet. The small hope I had of keeping my feet somewhat dry went away during the walk from the Athlete’s Village to the starting line. WEAR GOOD SOCKS and you won’t blister. You’ll just have soaked feet, but eh, what are you gonna do. 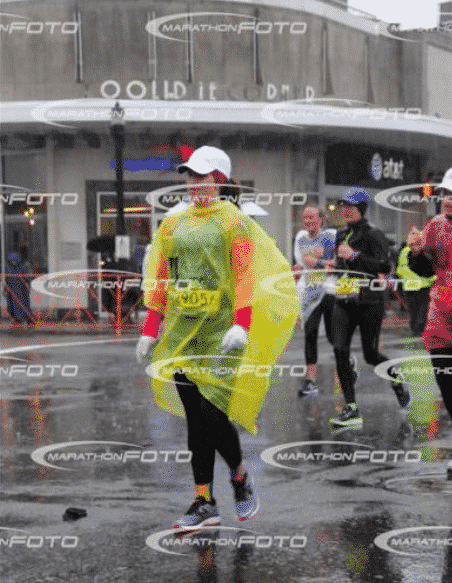 POSITION YOUR SUPPORTERS STRATEGICALLY ALONG THE COURSE – If you have multiple people heading out to spectate and support you along the course, have them bring reinforcements – like a dry change of gloves, arm sleeves, hat…anything dry! Even though it only lasts for a few minutes, it’s a real shot in the arm to change out of soaking wet arm sleeves or gloves into dry ones. Even though race day 2018 was miserable, it was also the absolute best thing I have ever done. Embrace the crazy and just keep putting one foot in front of the other! High five all the spectators and try to smile. If you have to walk, then walk! Appreciate the hard work you’ve put in to get you to this moment. You’ve got this!